The very first piece of work I ever had published. This April 1978 photo of a car crash was published in the Redwood City Calif., Tribune. I was paid a whopping $15 for it. As for photography, in high school my best friend Dennis showed me how to develop film and print my own photos. I set up my own darkroom in the bathroom, complete with my own enlarger, to be able to do it all from start to finish by myself. I went through a lot of rolls of film, shooting everything from the Blue Angels flying team (timing one shot so perfectly that two jets, passing by each other at full speed, are just one strangely shaped blob in the resulting photo) to accidents — such as the one shown here, well before my medic days — and structure fires. By the time I got there, flames were often well established; by the time the engines arrived, I would have a number of good photos showing how the fire grew — and was able to tell the arriving firefighters that there were no victims trapped inside. January 1982. One of the early house fires I shot, this one in Manila, Calif. Can you spot the fireman approaching the front door? No one was hurt in this one. In college, I started a commercial photography business to bring in a bit of spending money. My biggest client ended up being the giant utility, Pacific Gas & Electric Co. They needed periodic advertising and public relations photos, and they had a choice: either fly the company photographer in from San Francisco, or use a local guy who always turned in good work for what they thought was a reasonable price (and I thought was a minor gold mine! ): $24/hour, plus expenses. Not bad for a student in the early 1980s. Most of the rest of my income was an attempt to do some architectural work — shooting fancy houses for local real estate agents — and doing the photos for catalogs. There wasn’t much work in such a rural area, but the work I did do brought in some nice spending money: it enabled me to buy quite a bit of nice camera equipment as well as pay for my “extras” as a student, like dinner out once in a while. And since I was, at the time, in journalism school, facility with a camera came in handy. I was also at the time a volunteer search and rescue sheriff’s deputy. Put those skills together, and the County Sheriff was happy to have a trained Public Information Officer to help Get The Word Out about the great guys on the search and rescue team that saved all the tourists who got lost in our dense redwood forests. The Humboldt County Sheriff Search and Rescue Team’s Public Information Officer at work. (That’s me, far left, holding the camera.) Suiting up to rappel down the out-of-frame cliff on the left is Deputy Brad Smith (looking down). 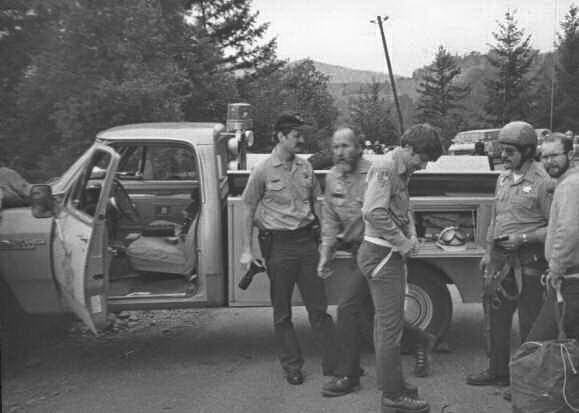 He ended up with the unpleasant job of checking for evidence around the dead guy half-way down the slope, and then loading the already-decomposing body into a “stokes basket” to be hauled back up to the road. I had enough nifty equipment that I took this photo myself. I’ve also done some various “arty” kinds of photos, including nudes. Someday, when digital cameras are (much!) better, I’ll get back to photography, as opposed to snapshots.